The TTIP (Transatlantic Trade and Investment Partnership) is a trade agreement being negotiated between the European Union and the United States for the establishment of a free trade zone between Europe and North America. The negotiations around it have raised criticism about the lack of transparency of the process, the subordination of democratically elected governments to the interests of big corporations as well as the downgrading of social, health and environmental standards it might cause especially in Europe. 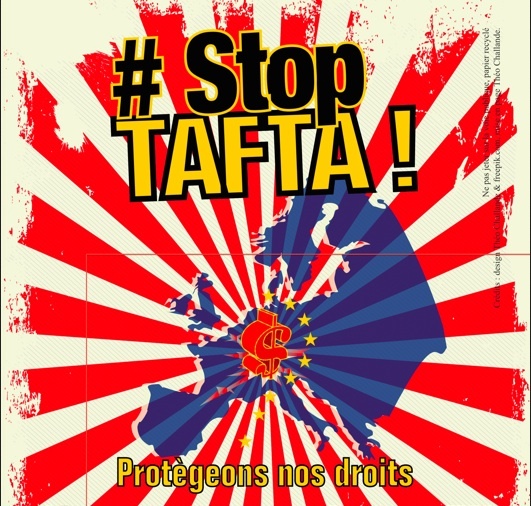 Beyond these fundamental issues the TTIP, also called TAFTA (Transatlantic Free Trade Area), is a misidentified political object because of the complexity of its content but also because of the lack of media coverage despite its importance. However, the TTIP has been debated with increasing intensity on the internet. The online discussion on the issue occurs on forums, blogs and social networking sites such as Twitter. 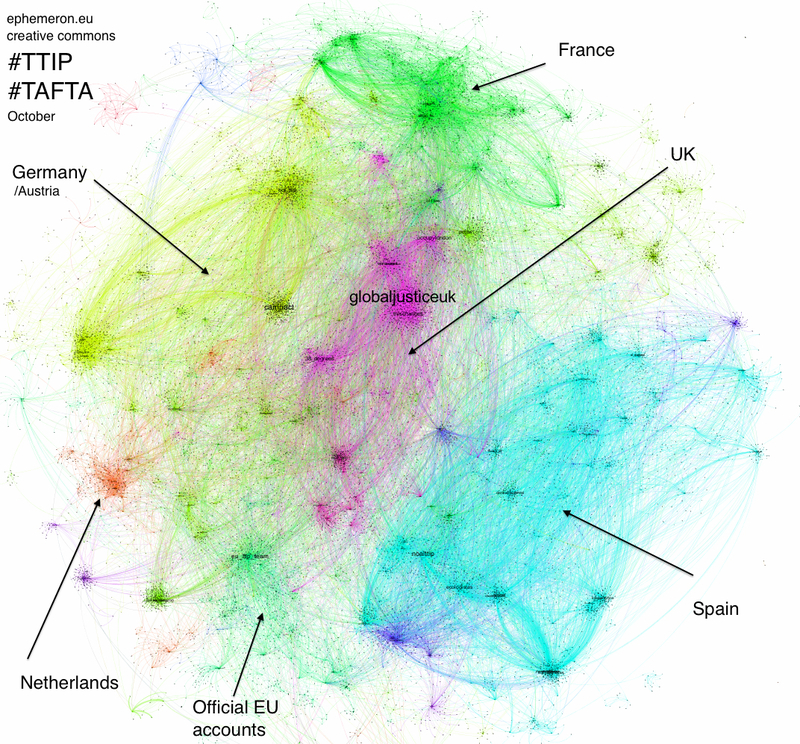 To understand the structure of the debate on Twitter I collected two samples of several tenths of thousands of tweets containing the words TTIP and/or TAFTA during two key moments of the anti-TTIP protest. The first moment was between July 15 and 22 2014. On July 15, the TTIP was discussed in a stormy plenary session of the European Parliament in Strasbourg. The same day a European civil initiative, Stop TTIP, submitted a citizen petition demanding the suspension of negotiations. The Stop TTIP initiative brings together 150 organizations from 18 member states of the EU. Throughout the week various demonstrations against the TTIP took place in several European cities. The second moment was three months later between October 9 and 13 2014. On October 11, some 400 activist groups marched all over Europe against TTIP. At this occasion numerous events were held in several European cities like Hamburg, Berlin, Madrid, Ljubljana, Helsinki, London, Athens, Vienna and Paris. The data from Topsy below show that in both cases the TTIP protest produced a peak in the use of the hashtags that started just before and ended right after the demonstrations. However the peak of July 15 with almost 3,500 tweets is much lower than the peak of October 11, which gets up to almost 12,000 tweets. A network analysis of my sample produced the following graphs that represent the networks of interactions (mentions and RTs) between Twitter users, including the two keywords, respectively on July 15-22 and October 9-13. The dots represent Twitter accounts that produced at least one message with the two keywords. The lines between the dots represent the interactions between these accounts (RT and mentions). The topology of the graph is the result of the intensity of interactions between accounts. The more two accounts are characterized by an intense two-way communication between them, the closer they are on the map. Dot size (smaller to bigger) depends on the number of mentions and RTs received. The colour depends on the community to which they belong. The data was collected with DMI Twitter Analytics The graph was made with Gephi using the Open Ord algorithm. The first observation one can make is that the discussion is structured by country or, at least, by language. Indeed, different clusters of accounts are visible that correspond to linguistic or national groups. Of these the larger groups are those of Britain, Germany, Austria and Spain in both graphs. The cluster of French users is bigger in the second graph, suggesting a rise of interest in the country. The reason is because in these countries the TTIP issue is present in public debates through different angles: weakening of the powers of Länders in Germany, GMOs and environment in France, defence of public health service in Great Britain, austerity and economic crisis in Spain etc. On the other hand the cluster of US and Canada based users diminishes and dissolves in the second graph probably because the protest movement of October was mainly European. Globally, European Twitter users involved in the debate are far more numerous than those from North America. The second observation, which is quite remarkable, is the absence of mainstream media among the most cited nodes of the network. Indeed, very few accounts of newspapers, TV channels or press agencies are significantly cited by other users except for alternative or marginal media. For instance in France the most cited media are the communist daily L’Humanité and web only and politically engaged outlets such as Reporterre (ecologist) and Mediapart (leftist). This means either that mainstream media downplayed this issue being focused on other topics (this is particularly true on July when there were two important conflicts in Gaza and Ukraine). Or that users who are interested in the issue of the TTIP don’t trust mainstream media. Or both. The same is true for established politicians, European institutions and official TTIP negotiators. 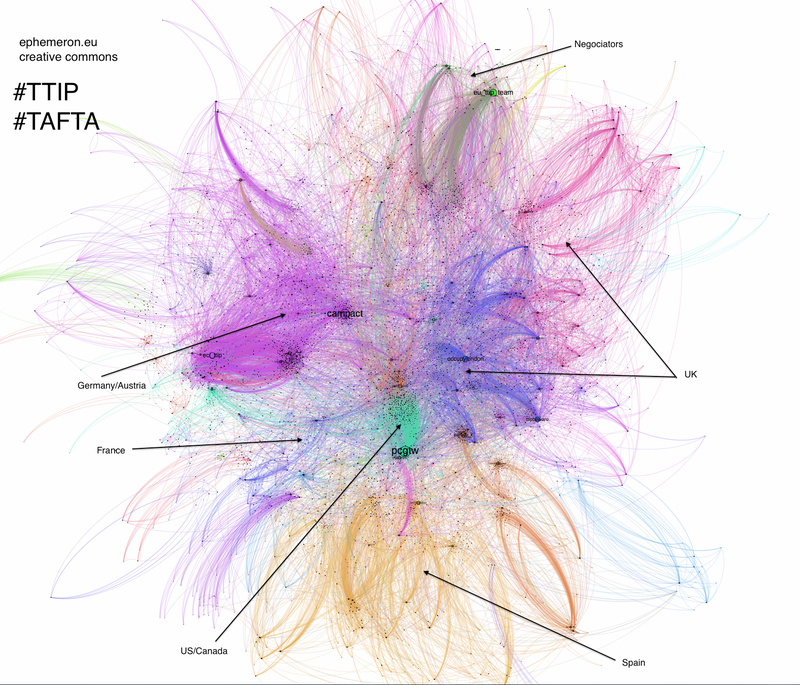 The two US and UE negotiating teams’ Twitter accounts have a large number of citations but still are very far from accounts of activists, alternative media and non-governmental organizations. The same goes for established politicians. The only established European political leaders that significantly cited or mentioned are David Cameron and Marine Le Pen. At the same time the political organizations and parties of the ecology and the radical left that oppose the TTIP are much more visible. Therefore it seems that the issue of TTIP is focused on by parties that are in the margins of the European political scene such the Ecologists, the radical Left, the Pirate Party and, to a lesser extend, right wing populists. The social democrats and the conservatives, who are involved in this debate, like the German SPD depute Bernd Lange, are very few. Obviously this is because the social democrats and conservatives head the UE and are mostly in favour of the TTIP. But the heart of the debate is made of a multitude of non-governmental organizations, associations, institutes, and think tanks, often created specifically to counter the TTIP. Among the most prominent are Public Citizen and Expose the TPP in the US, Occupy London and the World Development Movement in Britain, Campact in Germany, ATTAC in France and the European initiative Stop TTIP. This kind of transnational political issue seems to be well adapted to the political usage of Twitter. The discussions that take place are dominated by opposition to the TTIP, structured by national and linguistic factors, but at the same time, interactions between groups are significant. We can deduce that these are steps towards the emergence of a transnational public sphere, increasingly extended, corresponding to the contours of the UE. Meanwhile, as for the issue of austerity in Europe, the TTIP question seems to be adressed mainly by political forces that are marginalized in power games either nationally or inside the UE.